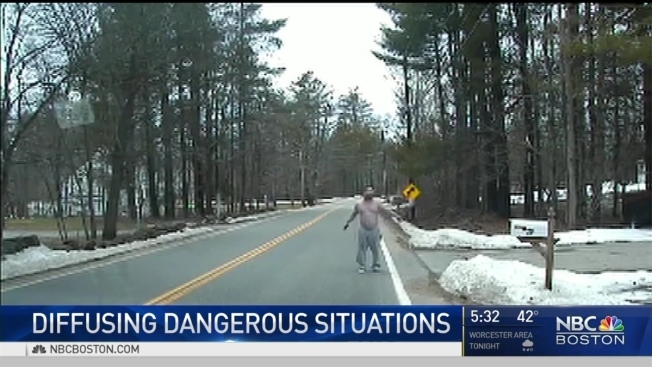 Residents of Pelham, New Hampshire, are expressing gratitude to their police department after officers were seen on video peacefully de-escalating a situation with a drunk, knife-wielding suspect. A video of a police arrest in Pelham, New Hampshire, is going viral after authorities say a drunk, knife-wielding suspect was taken into custody without incident. It's a situation that could have taken a tragic turn in the blink of an eye, but it didn't thanks to the professionalism of the officers in Pelham. When officer Brian Kelly started his Wednesday shift, he never knew it would end like this. On his dashcam video, you can hear Kelly tell the suspect to "put the knife down." His dashcam captured the chilling video of a highly intoxicated man walking toward officers with a weapon. "When I got there, there was a man in the street with just grey sweatpants on and knife in his hand, screaming," Kelly recalled. "A very dangerous situation." Sgt. Glen Chase was the third officer on scene. "You initially think this call could go sideways at any time," Sgt. Close said. "He was flailing the knife walking back and forth yelling vulgarities." For the next two minutes, despite repeated threats, all five officers kept their cool. "It was a high-stress situation, and he deserves respect just as much as anybody else," Kelly explained. Eventually, they convinced the man to surrender. Pelham residents who watch the video say they're proud to call these officers their own. "It's good to see the restraint on the officers' part," said Deborah Barton. "I feel protected," said Mary Workman. "It's just wonderful." The officers, while thankful for the support, say they were just doing their job - though they admit it's rare to be recognized for a job well done. "Police all over country have a difficult job, things don't go the way we want them to all the time," Kelly said. "But we do what we need to do to keep everybody safe."